My final 15 picks for Miss Philippines-Earth 2010; the petites will shine bright! Posted in: 1 Pageant Pages. Tagged: Abbygale Rey, Angela Fernando, Angelica Pasumbal, Aura Donna Garon, Boyet Blas, Christine Hermoso, Emerie Dale Cunanan, Gwennaelle Ruais, Kris Psyche Resus, Lady Lou Garidan, Larissa Ramos, Mabuhay Beauties, Manila Ocean Park, Marie Lorraine de Guzman, Miss Earth 2009, Miss Philippines-Earth 2010, Nadine Karla de Roxas, Nicole Kaufmann Ortega, Rene McHugh, Rosemary Joan Turner, Sian Elizabeth Maynard. Since the finals of Miss Philippines-Earth 2010 will culiminate in a grand pageant tonight at the Manila Ocean Park, I will now be sharing my Top 15 picks for the crown., I’m pretty sure one of these ladies will take it all the way and become the country’s official representative to the Miss Earth 2010 in Vietnam later this year. All the images below are courtesy of my good friend, Boyet Blas, of Mabuhay Beauties. By international beauty pageant standards, a lady is considered petite if she stands 5’5″ and below. And since the more outstanding candidates this year belong to the 5’4″-5’5″ height category, I sub-titled this blog emphasizing that the petites will shine bright tonight. In fact – save for the amazonic Gwennaelle Ruais who is at least 6′ tall – majority of the ladies are taller than the average Filipina but shorter than the generally pronounced statistic when fielded abroad. Nonetheless, what more than makes up for this is the fact that a good number of the 49 contenders have very beautiful and charming faces as can be seen in my 15 selections above. Anyways, if I had to whittle down the 15 to just my Top 5, at least 3 petites will enter the group and they are Pandan’s Emerie Dale Cunanan (gorgeous! ), Infanta’s Kris Psyche Resus (beautiful face and sensuous aura), and Meycauayan City’s Christine Hermoso (sweet face and visibly toned – albeit less shapely – body). This trio can possibly be joined by Lubao’s Angela Fernando and Taguig City’s Nicole (Kaufmann) Ortega. Conversely, if the judges would favor statuesque – in keeping up with previous winners who stand a minimum of 5’7″ – then there’s a high probability that the Top 5 would include Fil-France’s Gwennaelle Ruais or Fil USA East-Coast’s Rene McHugh and even make either win in the process. Unless one of the five really fails in the all-important environmental Q&A, Emerie, Nicole, Angela, Kris and Christine will likely come out on top. Posted in: 1 Pageant Pages. Tagged: Aiza Angelica delos Santos, Angela Fernando, Best in Evening Gown, Emerie Dale Cunanan, Evening Gown Competition, Face of Placenta, Gwennaelle Ruais, Hannah Marie Landan, Lady Lou Garidan, Ma. 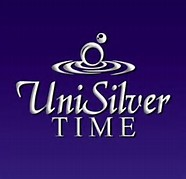 Rizel Macasa, Miss Earth 2010, Miss Perwoll, Miss Philippines-Earth 2010, Nicole Kaufmann Ortega, Rene McHugh, Sarah Jane Mercado, Sheena Arabani, Sian Elizabeth Maynard. The Evening Gown competition of Miss Philippines-Earth 2010 was recently concluded en route to the coronation night on April 24 at the Manila Ocean Park. Here are some of the 49 ladies who registered better than the rest in the said pre-pageant activity. Miss Municipality of Pandan Emerie Dale Cunanan who was adjudged as Best in Evening Gown. Posted in: 1 Pageant Pages. Tagged: Abbygale Rey, Alyssa Angelaine Tolentino, Cultural Competition, Kris Ortiz, Lorraine Asis, Ma. 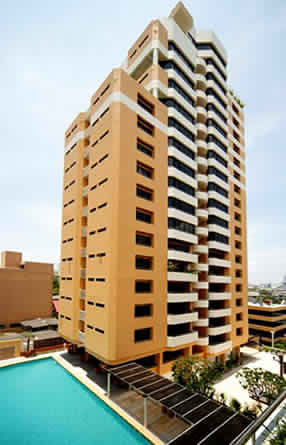 Rizel Macasa, Miss Philippines-Earth 2010, Nadine Karla de Roxas, Pamela Bianca de Leon, Pauline Dollaga, Sian Elizabeth Maynard, Vhristine Weizel Guzman. Just as I blogged about the standout creations during the Miss Philippines-Earth 2010 Cultural Competition, I felt the need to make a separate post on the ones which left much to be desired. Reasons I have for including the following in my less-than-desirable list of designs are poor execution and/or below average styling and/or mediocre aesthetics and/or lack of fluidity. Let me just say that I am not in any way stating any negative remark on the wearer but the outfit themselves. I also opted not to be too cruel with my remarks anymore because that would be adding insult to injury. At any rate, if you find my quick comments harsh, then just imagine what’s going on inside my mind while looking at them. 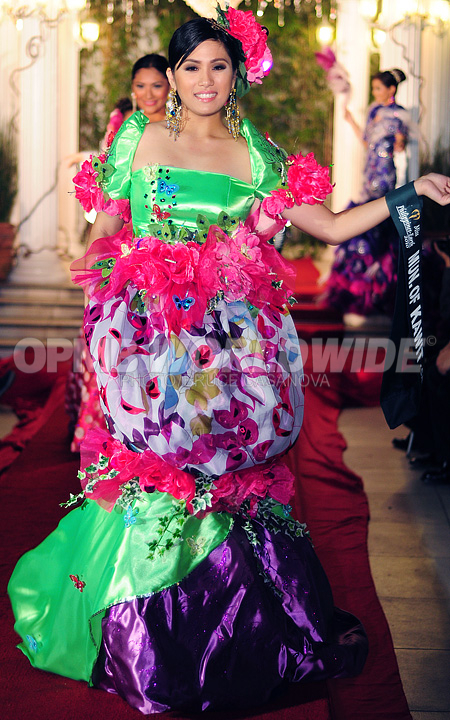 Miss San Jose del Monte City Lorraine Asis - OMG, I can't see even an iota of creativity in this design! 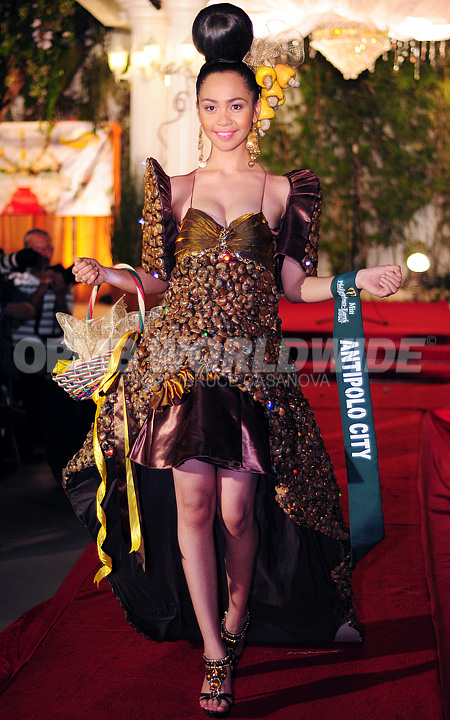 Miss Antipolo City Pamela Bianca de Leon - OMG, the styling makes her look like an alien! And what's with the flower girl basket with pitiful yellow ribbon hanging? 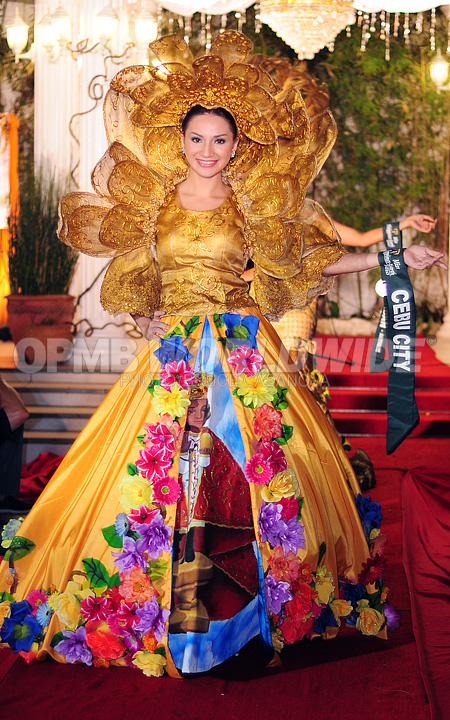 Miss Municipality of Bongabong Abbygale Rey - OMG, very amateurish and crude in execution! And a Big Bird headdress? Double OMG! Miss Municipality of Kawit Pauline Dollaga - OMG, she looked heavily pregnant and heavily-weighed down! 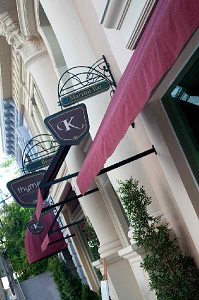 Miss Tagaytay City Nadine Karla de Roxas - OMG, another amateurish creation that falls short of polish in execution! Miss Cebu City Sian Elizabeth Maynard - OMG, I expected a lot more from the designer but this one makes the upper and lower parts created by two separate designers who did not collaborate at all! Miss Municipality of Angono Alyssa Angelaine Tolentino - OMG, the silhouette is right, but the execution and aesthetics are less than average. 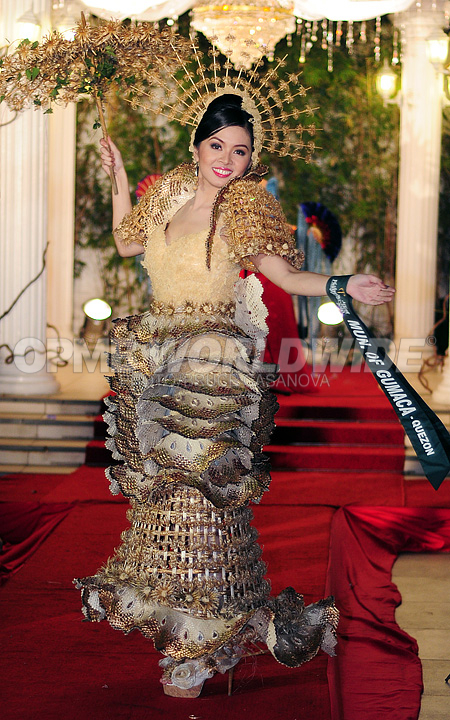 Miss Municipality of Gumaca Kris Ortiz - OMG, I can't help it...this costume could've been saved if not for the overly-busy design and odd placement of accents which look like oysters. 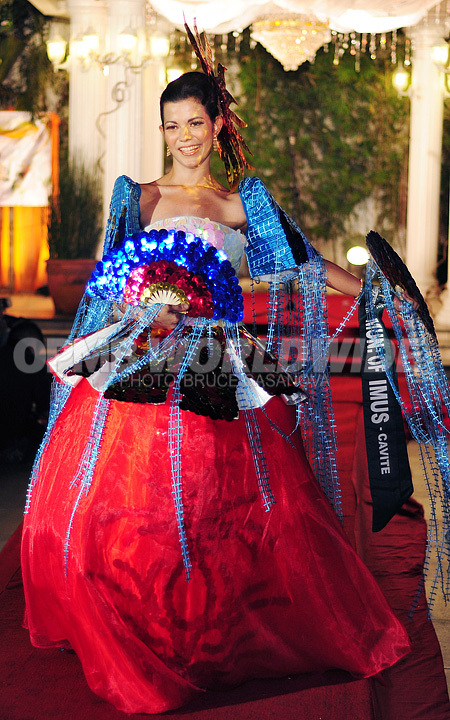 Miss Municipality of Imus Christine Weizel Guzman - OMG, what's with the obsession with tassles this year? This is one of the poorly-tassled pieces. Miss Municipality of Romblon Ma. Rizel Macasa - OMG, I wanted to like the concept but it just doesn't do it for me! I hope I didn’t offend anyone, but if I did…my apologies. I was expecting more from the participating designers. And please don’t start me with budget constraints because good taste, genuine creativity and resourcefulness do not necessitate exorbitant amounts to make all the time.